When you are eager to begin teaching, the Praxis Professional Learning and Teaching (PLT) 7-12 should not stand in your way! There may be no easy way to pass, but there is a best way! 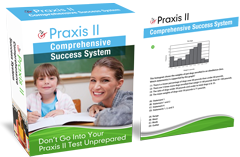 For teachers who are looking to pass the Praxis PLT 7-12 (5624) the first time—or the second—the best way to ensure you pass is to use great test-taking research as you study, do Praxis practice test questions and take the actual exam! Don’t make the mistake of thinking that you’ve passed your classes, so you’ll pass this test. This test is on all of your classes COMBINED! You’ve been taking the tests AS YOU WERE TAKING EACH CLASS. This is different! This test-taker not only failed to pay attention to time. The candidate failed to understand the scoring and probably failed the test. Why? The case studies are worth 25% of your total score! Just because you want to teach 7-12 grade students doesn’t mean you’re an excellent writer! Even if you are great at writing, are you concise? How long has it been since you’ve taken—and passed—constructed response exams? It all comes down to this: how can you use this information AND test-taking research to get a passing score on your first try? Follow these three steps! They may not be fast or simple, but they will lead you to succeed in passing the Praxis Principles of Learning and Teaching: Grades (PLT) 7-12 the first time! The Praxis Principles of Learning and Teaching: Grades 7-12 tests your knowledge of educational practices as a prospective 7th through 12th grade teacher. Whether you hope to teach math, agriculture, English, or special education, the material tested is NOT about your specific subject area. It’s about the “art, science, and profession” of teaching, or PEDAGOGY. The Praxis 5624 is made up of 4 questions in short answer format and 70 questions in multiple choice format. You’ll be given 4 instructional scenarios to analyze for the written short-answer portion. Those constructed response questions cover the four topics listed above, but THEY ACCOUNT FOR 25% OF THE TOTAL SCORE! Let’s face it: You need the best the best Praxis PLT 7-12 study guide and practice test you can get. To find the best preparation materials you first need find out what’s REALLY on the exam. After all, the four categories above are just vague topics. Find Praxis PLT 7-12 practice tests and study materials after completing the following checklist. Now you know WHAT is on the test AND what you have to study! You’re one step closer to getting the Praxis Principles of Teaching and Learning (PLT) 7-12 study guides and practice exams that will help you to learn the material required to pass. If you followed the checklist above, you already have a head start on knowing your strengths and weaknesses as you prepare to take the Praxis (5624). Do you have trouble taking timed tests? Do you second-guess your first instincts when answering multiple choice questions? Are you able to understand what Praxis PLT 7-12 constructed response questions are really asking? Have you had trouble in the past with “tricky” questions? What is your strategy when you KNOW you are spending too long on one question? Are you able to write short answers clearly using key words that show your understanding? Do you know how your test is scored AND do you know what that means for YOU? Each of these questions will help you to see your strengths and weaknesses as a test-taker. And YOUR honest answers to these questions will help you to choose the test-prep materials that will lead YOU to pass the first time. There are so many test-prep materials available: study guides, study manuals, flashcards, practice tests, prep classes and combinations. Which should YOU choose? If you’ve completed Steps One and Two, you have done most of the research already. Now, match YOUR needs with the study resources available. Look for a Praxis Principles of Teaching and Learning 7-12 prep book that is thorough, even if it is boring! Your #1 goal is to pass the test! It matches the 9-page PDF document in its terms and explanations. It includes current acronyms and theories. It bold-faces the terms you need to know. Find a PLT 7-12 prep guide that is organized like the test and is easy FOR YOU to use. Check carefully so it reflects the theories and strategies YOU need to review. A Table of Contents and/or Index lets you find that information fast. Check out the constructed response section (there better be one!) for tips on the essay portion. Is there a scoring rubric? Is the rubric explained? Is there at least one example of a strong constructed response answer? Is there an explanation of WHY the answer is well-written? Is there at least one full-length Praxis Principles of Teaching and Learning (PLT) 7-12 practice test? Are there easy to understand explanations of BOTH correct AND incorrect answers? Are there “practice” constructed response/essay questions for each section? Is the scoring of the test explained? Be picky about typographical or grammatical errors! A typo may be a simple mistake, but these guides are NOT cheap! If you find typos or grammar errors, can you trust the answers? Buy a guide without looking at reviews! But consider YOUR needs! Be “tricked” into purchasing an outdated study guide. Think that all Praxis PLT 7-12 (5624) study guides were written by people who know the exam. Just because the it’s published by a big-name company doesn’t mean it’s a good guide! Expect that it’s going to be a fun read. It may be dull but its purpose is to help you pass! Many test-takers say that 4-6 weeks is a good time to begin using a study guide. Plan to use your Praxis PLT 7-12 study guide every day for a set amount of time. 20, 40 or 60 minutes at a time is better than a six-hour cram session. Read through explanations of the answers; many test-takers say this is key to passing! Practice active reading: find a good study space, have a purpose for reading, and use a highlighter as you read. Once you’ve selected your Praxis PLT 7-12 practice tests and study guides, and USED them to YOUR best advantage, there’s only one thing left to do! The work of finding your strengths and weaknesses and knowing both the material AND the test itself means YOU do NOT have to spend extra time and money on retakes. Instead, you can spend YOUR time planning for your first year of teaching!